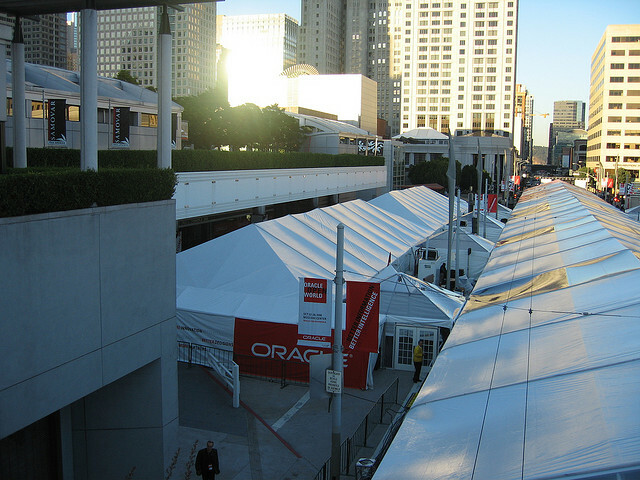 Exalytics, a server appliance for near-real-time business intelligence applications and a big part of Oracle’s big data response, debuted Sunday night at Oracle OpenWorld 2011. The Exalytics box — the younger sibling of the Exadata database machine and Exalogic middleware-and-application server — was front and center during Oracle (s ORCL) CEO Larry Ellison’s opening keynote. Ellison’s mantra was “parallel everything” when it came to Exalytics, as well as Oracle’s recently announced Sparc Supercluster, which he said melds Exadata database and Exalogic application perks into a single Sparc/Solaris machine. While there was no explicit mention of Hadoop or NoSQL per se, Exalytics — and its promised ability to handled unstructured as well as structured data — is clearly a big part of Oracle’s big data play. Oracle is expected to talk more this week how its database and middleware can coexist with and complement those big data technologies. Exalytics is powered by 40 Intel Xeon (s intc) cores and relies on Infiniband pipes to connect it as needed with Exadata. The secret software sauce is in-memory database technology that came with Oracle’s acquisition of TimesTen six years ago and the multi-dimensional database expertise from Essbase, which Oracle acquired with Hyperion two years later. “When you have [an] in-memory database working in parallel, it’s important to get the right data in memory. We have a heuristic adaptive in-memory cache… that tracks this. As different people ask different questions, it migrates different data in-memory. It keeps popular query results in cache,” Ellison noted. In-memory databases, and their fast response times, are a battleground as Oracle, SAP (s SAP), IBM (s IBM) and others try to claim supremacy in the burgeoning realm of business intelligence. There is no shortage of huge data stores, but a huge demand remains for tools to help companies better parse and apply this data profitably. That’s why SAP bought BusinessObjects and Oracle bought Hyperion. Accessing data in standard relational databases can be slowed by disk I/O issues. If the data remains in memory (or in cache), access is much faster. SAP is pushing its HANA technology to address speed-sensitive BI applications and SAP also bulked up its in-memory capabilities by buying Sybase. Given Oracle’s huge database market share, it’s hard to bet against the company in this arena although both SAP and IBM are strong contenders. And Ellison has said Oracle’s ability to incorporate new data types into its core offerings is a key advantage. On Oracle’s first-quarter earnings call two weeks ago, Ellison told analysts object-oriented databases were supposed to replace relational databases years ago. “What actually happened is that object database capabilities got integrated into the Oracle database,” he said. Photo courtesy of Flickr user Eddie Awad. In memory database is faster – that’s not news. The ability to handle unstructured data as fast as structured is news. Bayesian logic (Markov) w/ a mix of std Boolean and a dig-back to ’80s and ’90s AI research might do it. The key will be the contextual search. That’s what I like to try out. Where does this leave SAS? Interesting post! I`ll send it to all my friends!